After publication of the latest accounts, it appears that the McCanns have frittered away millions of pounds from their private company. Funds are down to £125,000, sapped up like water in a hungry sponge. 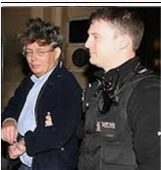 It may read that way on paper, however are the media failing to report the monies earned from Kate McCann's version of the truth - the book, Madeleine. Sitting nicely in the bank... gathering interest and destined to show in next years accounts? And what if it was dwindling? I'm sure with relative ease, the McCanns could save a mint by losing the lawyers, PR companies and come up with some novel way to search for their daughter like normal people would do. They like to raise awareness but how about selling some of their own assets, remortgaging their home or even doing a mammoth car booty. Even buying their strawberries from Rothley Market would be advisable compared to M&S prices. That's if they really need all that money. 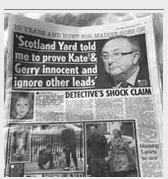 The McCanns and the press project a feeling of guilt onto the general public if they fail to donate. They aren't entitled to other people's money to keep their own company afloat. How do you think Kerry Needham has survived over the last two decades? Anyway, how about something really simple during those long weekends and school holidays. Borrow a camper van, tour those lawless villages and get knocking on some doors. Simple, beautiful country and lovely weather. They could even take the bikes. 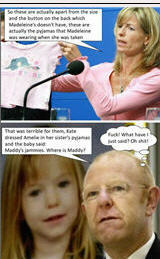 You never know (ahem) Madeleine might answer the door... errr, I'm sorry... the McCanns don't do personal search, do they? They prefer to leave the dirty work to other people. And dirty it is... whatever situation Madeleine finds herself and wherever her head rests right now is solely down to them. 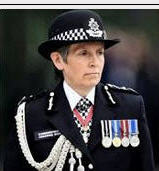 Really all of that doesn't matter, because a further £3.5m has been thrown in the McCanns direction in the shape of the Metropolitan Police "investigative review". So right now, there are law enforcement agencies investigating and searching for Madeleine. No need for fund raising, begging or petitioning. It would also be wholly irresponsible and a complete waste of money to still be employing Dave Edgar whilst the review is ongoing. 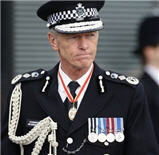 This effectively makes him and his salary redundant. What a saving! The fund is now foundation. Yes, after five years even good marketing ploys need rebranded. What next?... 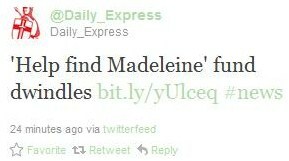 Madeleine's name? **Foundation... bad move to rename in this manner - the lowest of the low and something which is below ground. Back to basics, with foundations based on child neglect.